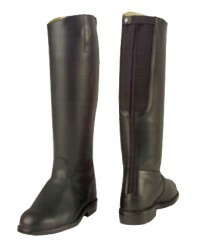 A high tech long riding boot designed to be suitable for all riding activities. Made out of the finest calf leather this boot ensures maximum comfort with a classic modern style. The Multi-Fit flexi leg allows up to 6 cm (2.3 inches) stretch over the calf and provides a comfortable snug feeling. The Climate Control Technology will ensure that your feet are comfortable whatever the weather. COOL in summer whilst WARM in winter. What more could you want from a boot?